Ciara defended Ben, Leo has a new Daddy, Marlena almost died again, while Jack used Tripp to capture Haley this week in Salem? 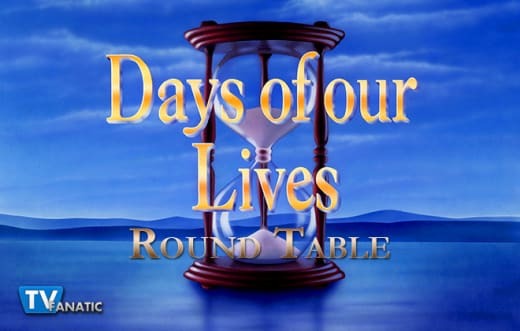 Our TV Fanatics Jack Ori and Christine Orlando are joined by Andy from MyHourglass a Days of Our Lives fan forum to debate Julie’s hypocrisy, Brady calling out Eric, Stefan’s best pairing, and who they’d want to be friends with in Salem. Did Ciara have a point about Julie being a hypocrite when it comes to Ben? Andy: I personally don't like the idea of conflating mental illness with committing a crime, or in this case murder. One shouldn't excuse the other. Ben may have been mentally ill before and during his time as a serial killer and he may never have an issue again. Regardless, it doesn't erase or excuse his actions, which I don't think he was ever punished enough for. I'll give credit to Ciara for pointing out the hypocrisy regarding Abigail, but I don't agree with her on Ben. Jack: Absolutely. Julie gives free passes to people she likes and no pass at all to people she doesn't. See also her treatment of Gabi. It turned out in the end Julie was right about Gabi, but how many years did she insist on judging her while Abby's murder of Andre is "justified"? Christine: Yes. Julie will defend her family no matter what. 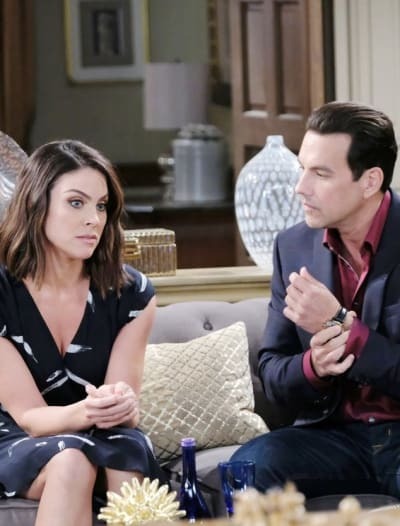 Nick was despicable and Abigail murdered Andre but finds fault with neither of them. On the flip side, Ben did murder people and I do believe Julie’s points are valid, but her judgment has never been even-handed. With which character in Salem would you most like to be friends? Andy: If I'm being shallow, I'd choose Will so that we can become more than friends. But seriously, I might pick Chloe or even Gabi. For all their faults, of which there are many, they tend to be good friends that will be there for you and have your back. As long as you're not in competition for the same man, which we most likely would never be! Jack: I’m sure it comes as no surprise to anyone on this panel or anyone reading it that I would love to be friends with JJ. I love his determination and willingness to say what he thinks even if it irritates people, and would totally love to play music with him. Christine: Leo! I think he’d be great fun to have as a friend, as long as he wasn’t trying to con you into or out of anything. I believe there’s a decent person in there somewhere and if he had a real friend he’d be quite loyal. Plus, he’d always be entertaining. My second choice is Chloe. She’s grown and matured so much. She’s accepting of other people’s flaws, works hard, and has an open heart. What has been your favorite Marlena near-death-experience over the years? Andy: I don't know if this truly counts, but her devil possession is one of my earliest memories of the show that I will always be fond of. I'm exhausted by the constant near-death experiences at this point, especially in the past couple of years alone. The most entertaining though was when Abigail trapped her with Kate and Vivian, that was a lot of fun. Jack: I've never been a fan of these stories. As a kid I was afraid of carbon monoxide poisoning after seeing her nearly succumb to it in the tunnels! I did like the Stella stalker story from years ago. Having an unbalanced patient go after her was interesting and at the time it hadn't been done a billion times before. I also liked when the Salem Strangler called her on her radio show. That was creepy without being over-the-top. Christine: Ooh. The Salem Strangler. I was just a kid but I loved that storyline! But my favorite near death experience was when Marlena literally talked a suicidal jumper in off the ledge and then ended up falling herself. Drake Hogestyn is a pro at portraying John’s angst over Marlena’s near death. He knows how to sell it. 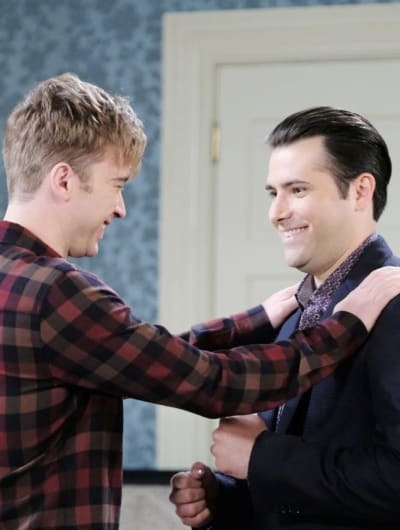 Should Brady have told Rex he found Sarah and Eric kissing in the chapel? Andy: Brady should try to get Sarah or Eric to come clean themselves. If Rex and Brady were brothers or even good friends, I would be okay with Brady telling Rex. But in this situation, it should really come from Sarah first, especially given how candid Rex has been about his infidelity. And if not her, Eric should say something to avoid this blowing up in his face and ruining his relationship with another brother. Jack: It's not Brady's business! Sarah is the one who should tell Rex. She is the one who is conflicted about who she wants to be with and at the moment is not being faithful. Christine: Sarah rushed back into a relationship with Rex when she obviously wasn’t ready. She needs to be honest with herself and with him. Personally, I think it would be smart for her to take six months and not be involved with anyone but that would never happen on a soap. Who has better chemistry with Stefan? Chloe, Gabi, that throw pillow, the picture of Stefano, or someone else? Andy: Stefan's best chemistry is with himself. I'm just not a fan of him in general, so it does nothing for me to see him with Chloe or Gabi or anyone. The chemistry they're trying to portray feels forced, like they're lumping together characters they don't know what else to do with. Jack: LOL at the throw pillow. I like Stefan and Ben's weird relationship. It's like a twisted version of what Daniel was to JJ a few years ago. Christine: I agree about Stefan and Ben. Their strange friendship feels more real than any of these other relationships. I like Stefan and Chloe getting to know one another as friends but the romance feels very forced and given Stefan’s history with GAbigail, that gives it a very icky feeling. What disappointed you the most this week in Salem? Andy: I was super disappointed in Jack this week. The way he barged into the loft and made such a spectacle of arresting Haley, with Eve filming it all, and Claire feigning innocence. It was just all really gross. And I'm disappointed in yet another Marlena almost dies storyline, has it even been a year since we went through this? Jack: The continued destruction of Claire's character is at the top of my list. Insecurity is one thing, but they're turning her into a super hateful person and I don't like it. Also, the way the investigation into Marlena's poisoning is being done is purely stupid, as usual. Haley's claim that she didn't write that note could have been checked in five seconds rather than Eli deciding whether or not to believe her, and nobody looked at security footage or considered the fact that Haley was ON THE RUN and not in the hospital when they were looking for her minutes before the attack! And Jack being so self-serving and smug when Haley was arrested was just gross. Amnesia or not, he shouldn't be so easily brainwashed into Eve #2. Finally... two seconds after Eric tells Sarah that Kristen raped him, she kisses him without permission. Yuck! Christine: Jack using a nephew he doesn’t even know and tormenting a young woman for political gain. I’ve always loved Jack Devereaux but, amnesia or no, this made me ill.
And I agree about Ciara's hairstyle. It was incredibly distracting! Andy: As much as I have disliked Leo, now that he's not in full villain mode he's more entertaining. It's fun to see him interact with different people like Brady, Stefan, and Ben and just be his ridiculous, shameless self. Tripp was very believable when he attacked Jack for coming after Haley. The scene was infuriating, but well done. Jack: I was surprised by how much softer Leo was when he was with John. He clearly has longed for unconditional love and was excited to be related to John. It seemed to change him for the moment and he even told John his suspicions about Diana in order to help rather than to cause trouble or to get money somehow. I thought that was the best scene of the week! Christine: Leo finding out that John was his father. He’s so desperate for love and acceptance that he immediately hugged John like drowning man looking to be saved. I’m looking forward to seeing more of these two together. OK TV Fanatics! Who would you want to be friends with in Salem? Leave your answer in the comments below.